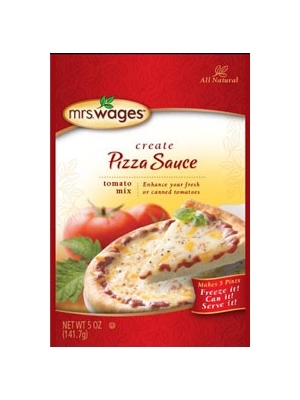 Mrs. Wages Create Pizza Sauce Mix contains just the right spices with fresh or canned tomatoes, or tomato paste, and give your pizza pizzazz. Makes 5 pints and is ready to eat 24 hours after preparation. 5oz. Food Starch, Maltodextrin, Salt, Dehydrated Onion, Spice, Paprika, Citric Acid, Dehydrated Garlic, Soybean Oil, Celery Seed.